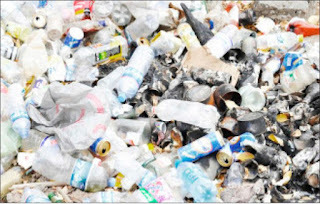 Lagos – Did you know that you can recycle every type of plastic? And at least 20 per cent of what is in our garbage bins right now should be in our recycle bins, according to experts. Yet it is important to note that not all items can be recycled in this way. The most common recycling mistake is throwing in soft plastics such as plastic bags, food packaging or any ‘scrunchable’ plastic in with the rest of your plastic containers. This is just as researchers have raised alarm over the growing rate of plastic pollution because of its effects on humans and aquatic life humans and aquatic life. Just recently, the World Economic Forum, in its review, puts pl astic wastes ending up in the ocean at 80 per cent. The World Economic Forum’s review further reported the possibility of the ocean containing more plastics than fish by 2050, if problems associated with plastic pollutants are not adequately addressed. It was not surprising that the Lagos State government has raised alarm over what it described as threat of plastic contamination to a healthy environment. The government also reiterated its appeal to residents to support its efforts to control plastic pollution in the state. Mr. Babatunde Durosinmi-Etti, State Commissioner for Environment, made the appeal in Lagos, during an event to mark the World Environment Day which was organised by the Ministry of Environment, in collaboration with Save The Children International who sponsored the event. Durosinmi-Etti, who was represented by Mr. Babatunde Hunpe, the Special Adviser to Gov. Akinwunmi Ambode on Environment, stressed that plastic pollution creates serious environmental and health hazards by threatening the marine life. “As stakeholders, we all have a role to play in attaining a cleaner and healthier environment. We need to encourage bagging of wastes to prevent indiscriminate dumping and cooperate with the government in its efforts to make Lagos a cleaner state,” Durosinmi-Etti said. He urged the residents to exhibit their actions in line with the 2018 WED theme: “Beat Plastic Pollution” aimed at reducing, reusing and recycling. The commissioner said that the global event underscores the need in Lagos State to rededicate national efforts for sustainable development by putting environmental concerns at the centre of all developmental plans. According to him, this year’s WED is a day set aside to address numerous environmental concerns and problems that threaten not just the human race, but planet as a whole. Corroborating the World Economic Forum report, Durosinmi-Etti alerted that the ocean may contain more plastics than fish by 2050 unless problems associated with plastic pollutants are adequately addressed. He said, “It is already a well-known fact that marine life is threatened by plastic pollution. Aquatic animals are hurt when they get trapped in the web of plastic wastes or feed on these wastes, which often lead to their death. “Furthermore, degraded bio-products have also been proven to have negative effects on the reproductive capabilities of fishes. “For the avoidance of doubts, established plastic pollution facts stated that the world uses 500 billion plastic bags in a year,” he said. According to him, facts have it that eight million tonnes of plastics end up in the oceans. He said people had not reused or recycled plastics appropriately and that they bought more plastics than they needed. The commissioner said there was need to find alternatives to eradicate the menace caused by these products to help sustain and save our environment. “We have only this planet to call our home, let us make it livable for all and for future generations. The responsibility to save and sustain our environment begins with us as individuals, communities, governments and industries,” he said. Ms. Nwamaka Ifionu, Acting Area Operations Manager, Lagos and Calabar Save The Children, explained that the event was to create awareness about environmental sanitation. She urged the people to take steps to effectively check plastic pollution.